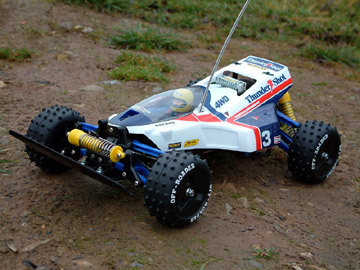 Yes, Tamiya have re-released a proper vintage 4WD. 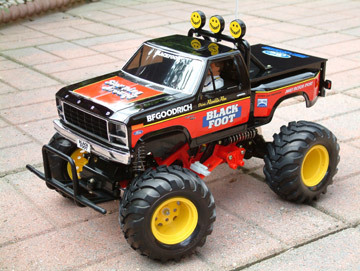 Sorry, I mean their first 4WD car from 1985. A true 'Classic'. With it's aggressive looks and great handling. The Hotshot is back! Nothing too serious here, just a great build I wanted to share with you all. A better motor is also required. You can use the kit one, but it will be slow. These old 4WD's need just that bit more punch to get the best out of them. I used a 'GT Tuned' (25T) one here. 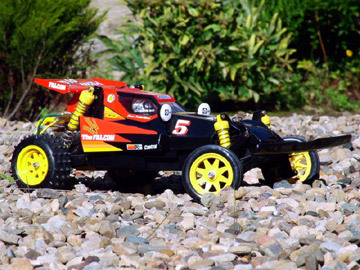 The manual is your normal Tamiya masterpiece. So easy to follow and nothing to trip you up. So here goes..
Steps 1, 2 & 3, Rear gearbox assembly. Use plenty of grease and don't be too harsh with those screws, nip them up slightly. Step 4, Motor & pinion. I've used a 15T here. Should be good all-round gearing. If not I'll change to the 13T. Remember to get the spacing right (17mm from end of motor to outside of pinion) if you don't, it will soon strip that drive gear. Remember that the higher turn motors such as the supplied 27T have more torque and generally can stand a larger pinion. As a rule the hotter the motor the more you should gear down with smaller pinions. Sounds odd but the smaller pinions will actually allow these motors to run faster! Step 5, Attaching the motor. Always a very tricky one on this type of 4WD. It's those set plates that are a pain! Best way I find is to mount the motor first with the top screw and tighten so you can just move the motor slightly. Then drop the set plates in the slot. Just feed your other screw in between the plates and tighten.. Simple! Don't tighten this screw too much as it sits on the soft plastic washer (B6) and will distort. Steps 6, 7 & 8, Front gearbox assembly. Easy enough. Just use plenty of grease again. The gear H1 might need a knife or rub down, it has sharp edges sometimes that can cause the gear to bind with the H3 gear. Screw the two gearbox halves together with two screws only and feel if it's ok with by spinning the propeller joint. Steps 9, 10 & 11, Rear suspension assembly. No problems here. I don't use the grease on the screw pins as I don't see the point. But be very careful tightening those screw pins up. Don't even nip them up, just screw in until the head touches the plastic suspension arm. They crack ever so easily. Steps 12, 13 & 14, Front suspension assembly. No problems here, just assemble as per manual and don't go mad with those screw pins! Steps 15 & 16, Top chassis assembly and paint. Painting already?! Yes, the old driver needs some clothes. I've found it easier to spray the drivers helmet now with any old colour you have left in your paint box. Step 17, Suspension crank. Make sure you get the MP1's the right way around, because those E-rings are a pain to get back off! And when tightening E6 onto the shaft hold the shaft under the ball head, so if the pliers slip you wont see a mark on the metal as it's covered by E2 & E4. Or just screw a normal screw into E6 first to make some threads so it's easier. Steps 18 & 19, Attaching gearbox's. Simple, no worries here. Don't forget the sponge MD2 in the front propeller joint. Steps 20, 21 & 22, Damper assembly. I don't usually like doing dampers, but these are great! They are different and better than the originals internally. I've always thought the pre-load adjustment is a great design, so simple. Before you attempt to screw on parts D2 & D3 (damper bottoms) screw a 3mm screw into them first as they are very difficult to screw onto the damper shafts if not. Steps 23 & 24, Attaching dampers. Just follow the manual, no problems. Steps 25 & 26, Checking radio gear and servo saver assembly. As you all know, this is just to make sure it all works and to centralise your steering servo. Steps 27 28, Steering servo. The steering rods might want to be a little shorter. You can adjust them later easy enough. Step 29, Radio installation. You can have nice neat wires if you wrap them around a screw drive shaft tightly. Mainly the servo and speed controller ones. Not the motor and battery wires. Step 30, Attaching lower chassis. Hope you have a good arm. These screws take some getting in! Make sure everything is right before you tighten up. Steps 31 & 32, Front bumper and steering set up. Do exactly how it says in the manual with the BA2 screw. It does need that screw lock. Adjust steering as it says. Steps 33 & 34, Roll cage assembly. The window netting is a pain to fit. Don't use as many nylon bands as it says. I managed with three per side not six! One of the only changes I've noticed here to the original car are the plastic rods moulded under the wing attachment, to stop the wing hitting the heat sinks when the car rolls over. Be careful with all the screws here also. The plastic is ever so soft. Steps 35 & 36, Dummy heat sinks. You just have to fit these. They are a nice finishing touch, keeping the new Hotshot looking original. It amazes me how Tamiya go to such lengths on detail. Keep your wires neat again and tuck them into the chassis out of the way. Step 37, Attaching battery plate. The sponge isn't going to do much, but use it anyway. Don't forget the two screws to attach the bottom of the roll cage. Steps 38 & 39, Wheels! My favourite part. The new oval bloke tyres are softer. The old ones used to hurt putting them on! No glue is needed. Just make sure you get them the right way around. They just look better that way. Don't over tighten the wheel nuts also. The triangle wheel adapters will split. Steps 43, 44, 45, 46 & 47, The body. It's a tiny body, but an easy one to do. Do your holes first. Then start cutting it all out. Making sure it sits right on the car. I always use three tools for doing lexan bodies. Straight scissors, curved scissors and a sharp knife (scalpel) Makes the job far easier. Any hard to get to places or straight lines to cut, use the knife to score into the lexan. Then bend it until it snaps off. Give it a really good clean ready for some paint. I used 4 coats of Tamiya Bright Red to bring more life into the final look. The normal red is quite dark. Any type of red colour is a must on this car. It just doesn't look right in any other colour really. Glue the spot lights together before you paint them. It stops them from coming apart while your painting them. Once it's all dry and you've taken the protective covering off you can fit the decals and the spot lights. The best part in my book. I used some originals i had as well as new ones. I don't like some of the news ones. 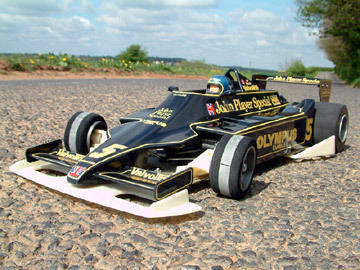 The body does rub in certain places when fitted to the chassis, so use some tape to protect it inside and then you don't get the paint coming off. The front stabiliser mount screws are the main culprits. All finished!! Step 48, (my step) Fit a vintage underguard. They are great, cheap and save the bottom of the car from snagging etc. Available from your local ebay store. You now have one enjoyable mean bit of kit to thrash and abuse. The Hotshot is just a pure joy all the way... 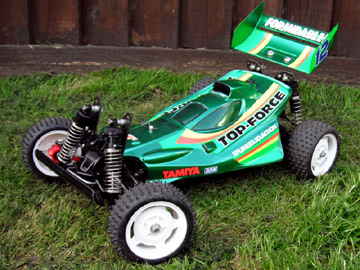 Cheers Tamiya!